I’m Like a Gourmet in a Skid Row Diner. pop quiz: the lyric above is from what song and artist? clue: 0.01 litres is not much for a bowl of soup. I am a big fan of melted cheese. I am a big fan of boiled new potatoes. So, I should be a fan of Raclette, and I am; except when I am asked to pay a silly number of Euros for it in some fancy mountain restaurant in the Three Valleys. Lots of thick slices of Cheese; the French have Raclette cheese, but any flavoursome hard cheese will be perfect. Big bowl of small boiled New Potatoes. Huge plate of cold, sliced Cooked Meats; select your favourites. Jars of Cornichons, Silverskin onions or any other Pickles you enjoy. Mixed Salad; baby gem lettuce leaves, cherry tomatoes, chunks of cucumber and red/orange pepper. Grilled Vegetables; courgette, aubergine, sprouts, mushrooms. Give everyone a small plate and cutlery. Lay the table with serving platters of all the different ingredients, everything is optional. Here’s the tricky bit. The cheese needs to be melted. The French have a kitchen gadget for doing this. I assume you haven’t, but may have a cast iron pan or skillet. Pre-heat your grill on a hot setting. Place a layer of cheese slices in your cast iron pan and grill quickly until the cheese starts to melt, bubble and go brown. Pour this melted cheese into a bowl on the table. 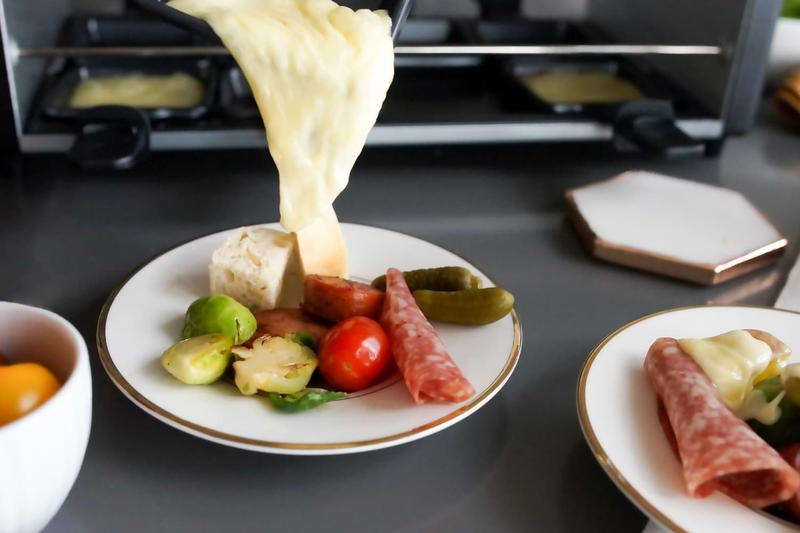 Raclette is a very social meal so let everyone just tuck in. Repeat the cheese melting task until everyone has got cheese sweats! For other delicious and easy Mountain Recipes, mostly veggie, please visit the CooKING category. pop trivia: The line is from ‘Life is a Minestrone’ from 1975 by Manchester band ‘10cc’.